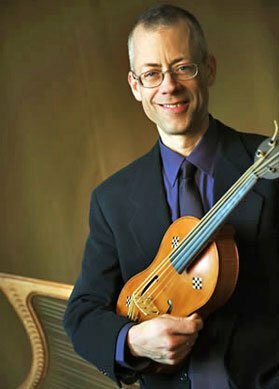 The program’s title is a mouthful: “Christmas at the Courts of 15th-century France, Burgundy & Cyprus.” Music director Scott Metcalfe made a compelling argument for including Cyprus, the geographic outlier, since it was ruled by the French and the music then flourishing on the island was clearly in communication with artistic trends in parts of the Hexagon. This program also spanned occasions: the religious music of Christmas was present, but so was the lighter-hearted and more secular music celebrating New Year’s. The pairing worked well for audience and performers, and in two hours gave us tastes of holiday celebration 15th-century-style. Ex tenebris lux: Beginning in a darkened church with “O clavis David,” one of the early “O Antiphons” written for the week leading up to Advent and welcoming the birth of Christ, transported us to a world of light and learning during the darkness of the year. Culminating in the Christmas Eve antiphon, “O virgo virginum,” this part of the program also began its next arc—settings of praise of Mary, including Josquin’s “O virgo virginum” and Brumel’s “Ave Maria gratia dei plena.” A new personal favorite is Guillaume Du Fay’s “Conditor alme siderum,” an alternatim hymn for Advent. With the lights turned up we reached Christmas and the end of the first half with Brumel’s “Nato canunt omnia.” With all singing so harmoniously, it was a joyous time indeed. …it is a bitter truth that some of the most joyous Christmas texts are marred by venomous barbs aimed at Jews and others regarded by Christianity as unbelievers; some of these were set to beautiful music.… We are performers who want to enjoy what we are doing and convey that enjoyment to our audience, and we don’t feel obliged to sing words we find hateful. This eloquently captures the dilemma performers face, and this emended text of “Letabundus” (thanks to Richard Tarrant) allows all to revel in the joy of the music and not find themselves displaced by the theology of hate that has turned many of us away from the Church (in its now manifold incarnations). The review by BMint’s Mary Wallace Davidson has some interesting discussion [here]. Next came music for New Year’s Day. Here the work was freer in style, texts in the vulgate (here, old French), more popular in form. Wishes for a good day and a good year joined with praise of the beloved and longings to see and be with her (Grenon, Cordier, van Ghizeghem, Du Fay). Interspersed were some instrumental pieces: out came vielle, rebec, lute, and harp to join the otherwise a cappella voices. Here, too, some singers appeared in solo numbers. I was intrigued by Cordier’s “Belle, bonne, sage, plaisant et gente” sung magnificently (of course) by Martin Near: a New Year’s song of joy and of love, it is also a sort of moral blazon cataloging the beloved’s qualities. Christmas is a serious occasion filled with theological purpose, mysteries of the faith, and music of hope and light during a dark time of the year. The 12 days of feasting include lighter revels, as at New Year’s, but the cycle beginning with Advent returns to seriousness with Epiphany. So, too, this program charted a course from otherworldly, religious ecstasy to earthly delight, before returning to lofty pleasures. We ended with Christmas music once more: Ciconia’s “Gloria Spiritus et alme (no. 6)” and the anonymously penned “Hodie puer nascitur / Homo mortalis,” an anonymous Cypriot manuscript motet for Christmas day. Ecstasy and delight found themselves paired in this celebration of birth and rebirth. We left the concert brightened, lightened, warmed.